MODERN ADDRESS Located on Co. Rd. 82 near 4 corners. DISTRICT BOUNDARIES Little Carnelian Lake marked the northern boundary of the district and it extended south to the norther border of Stillwater. DISPOSITION Now moved to Stillwater, a residence. The struggle to organize the district was a “long and bitter one” (Stillwater Gazette). It was originally District 50, formed from Districts 5 and 6, but dissolved shortly afterwards because of a “flaw in proceedings” (Gazette). The school was built around 1870, and Maggie O’Brien was the first teacher employed. 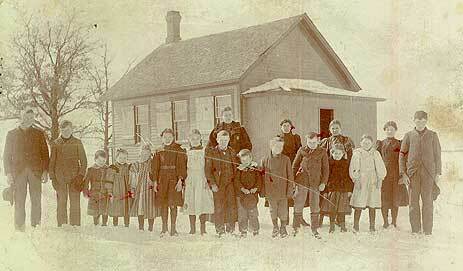 The school covered grades 1-7, and was 8 months long. The school lay between the Jarchow and Curtis farms. Enrollment in 1898: 25 students. From the 1900s through the 1930s, the enrollment was usually 10 to 15 students. Other teachers: (before 1898): Marion Yorks, Mary Brown, Clara Knipps, Mary Grady, Matie Collopy, Cassie M. Knights. (after 1898): Rose Noysen, Lila Short, Maude Mitchell.